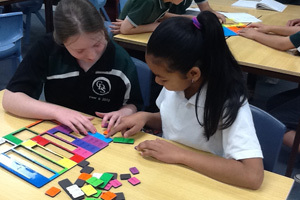 The Charnwood-Dunlop Mathematics program follows the Australian Curriculum: Mathematics. The curriculum is organised around three content strands; Number and Algebra, Measurement and Geometry, and Statistics and Probability. Embedded across these three areas are four proficiency strands, aimed at ensuring students proficiency in mathematical skills develops throughout the curriculum and becomes more sophisticated over the years of schooling. These strands are Understanding, Fluency, Problem solving, and Reasoning.